The insanity started Friday night. Oklahoma State, ranked 2nd in the BCS, traveled to Iowa State, and the game turned into a much closer affair than anyone imagined. Iowa State cornerback Leonard Johnson harassed Justin Blackmon all night, holding the Oklahoma State receiver to 99 yards on 10 catches. The road team Cowboys let the underdog Cyclones stay in the game with a soft defense and 5 turnovers. The last turnover, a Brandon Weedon interception in double overtime, led to an epic 37-31 Iowa State victory. The insanity continued on Saturday night. Oklahoma, the 5th ranked team in the BCS, tied the game with Baylor at 38 with less than a minute remaining in the game. After the ensuing kickoff, Baylor played for overtime with a running play on 1st and 10. Oklahoma quickly called timeout in hopes of getting the ball back in regulation. This aggressive call backfired when Baylor quarterback Robert Griffin, an Olympic caliber 400 meter hurdler, ripped of two long runs to move the ball up the field. Finally, at the Oklahoma 34, Griffin scrambled left, stopped in the face of the Oklahoma defense, and fired a pass deep into the right corner of the end zone. The beauty of the pass was its location in which only his receiver could catch it. Oklahoma’s national championship dreams evaporated into the Texas night. The insanity next surfaced in Oregon coach Chip Kelly’s head. Down 3 to USC with 2:54 minutes remaining, Oregon, 4th in the BCS, had 3 timeouts but 86 yards in front of them. Inexplicably, coach Kelly used only one timeout before the drive stalled in USC territory. No matter how well an uptempo offense works for the Ducks, two extra plays (3 if they didn’t take a knee in the middle of the field to set up the field goal) might have resulted in a touchdown or better field position. The field goal attempt sailed wide left, giving USC a 38-35 win. Oregon won’t play in the national championship game again this year. 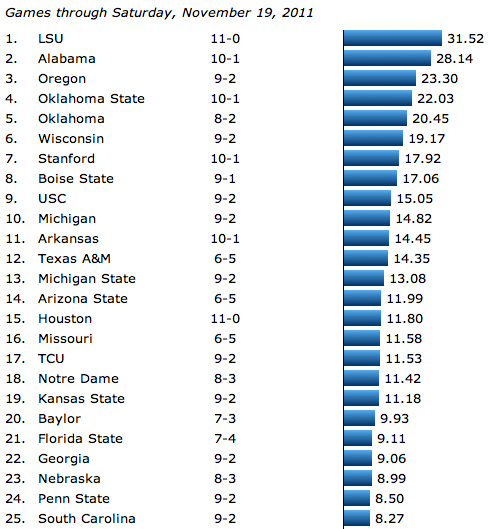 The losses to 3 of the top 5 teams has prompted media outlets to apply the term “chaos” to this incarnation of the BCS. But chaos doesn’t apply when a region of the county just smiles at the sight of LSU, Alabama and Arkansas at the top of the BCS rankings. It’s BCS tranquility down south. With LSU and Alabama in the first and second position respectively, these two teams only need to win their remaining games to play in the national championship game. The Power Rank gives LSU a 77% chance to beat both Arkansas at home and Georgia in the SEC championship game while Alabama has a 90% chance to beat rival Auburn. This implies a 70% chance for a LSU versus Alabama rematch in New Orleans this January. While a fresh matchup might feel more satisfying, LSU (1) and Alabama (2) are both 5 points above any other team in The Power Rank. Two other scenarios merit some attention. What if Arkansas makes good on the 13% chance they have of upsetting LSU in Baton Rouge? Assuming Alabama beats Auburn, this leaves 3 one loss teams in the SEC West. To break this stalemate, the SEC picks the top team in the BCS, expect if the 2nd place team is within 5 places, because then it selects the head to head winner between the top two teams. Make sense? Good, because then you can explain it to us. We won’t attempt to predict how the BCS will reshuffle these 3 teams in this situation. Last, we consider an Alabama loss to Auburn, an event with 10% likelihood, coupled with an LSU win over Arkansas (87%). The second losses for Alabama and Arkansas would open a spot in the national championship game for a non-SEC West team. To calculate the likelihood that any team ranked 4th or lower in the BCS makes the game, we will assume each team must win their remaining games while the teams above them (except LSU) must lose at least once. The Power Rank gives the following chance for these teams. Stanford has a higher chance than Virginia Tech because The Power Rank puts the latter at 28th, much lower than their BCS rank of 5th. Despite only one loss, Virginia Tech has squeaked by bad teams (Duke, North Carolina) in their wins. Needless to say, these teams have very slim hopes of playing in the national championship game. However, up to two of them could end up in the top 4, which guarantees a BCS bowl game and its hefty payout. Have any scenarios that we’re missing? Please leave a comment. Here are some situations we considered but didn’t use above. LSU loses to Arkansas, makes the SEC championship game through BCS magic, but then loses to Georgia in Atlanta: 1.4%. LSU loses two games by the above scenario and Alabama loses to Auburn (This is the true BCS chaos scenario, since LSU, Alabama and Arkansas would each have 2 losses but SEC fans would still demand one of them play in the national championship game): 0.14%.